I promise I’m not trying to turn this blog into a travel blog, but I have been traveling a lot lately (read about Iceland here!). And I love it! 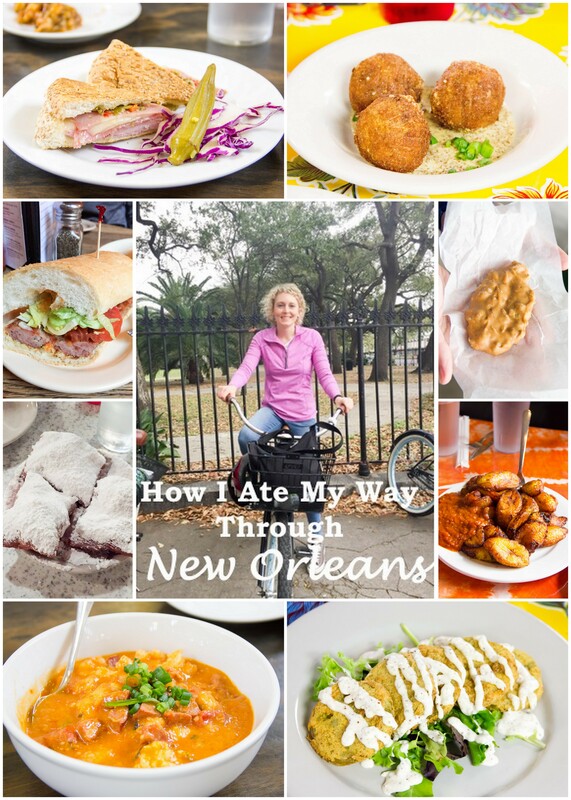 =) I just got back from New Orleans, and in true Kendra-travel-style, the first thing I booked was a food tour! After a bit of research, I chose the Confederacy of Cruisers Bike Tours, and it was a good choice! This was my first food tour in the USA and my first biking food tour (vs walking). I think I was able to see more of the city since we were on bikes. The bikes even had cute little baskets on the front for our bags! Victor, our tour guide, was not only a foodie but also spent most of his career in the food/dining industry. Each tour is different. Victor said he had about 60 restaurants he chooses from! 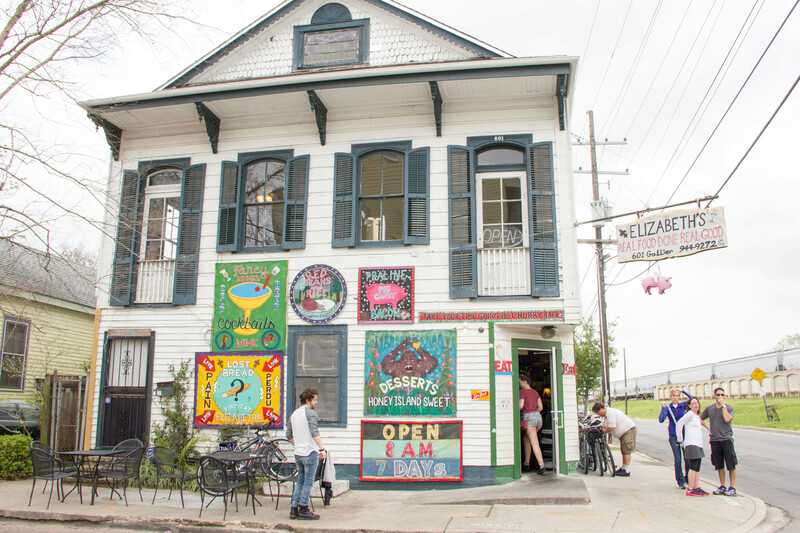 He started with a little history on creole cuisine. Creole just means mixed and so creole cuisine is just a blend of lots of different types of food – French, Spanish, West African, German, Caribbean, Native American, and probably a few more that I’m forgetting ;). 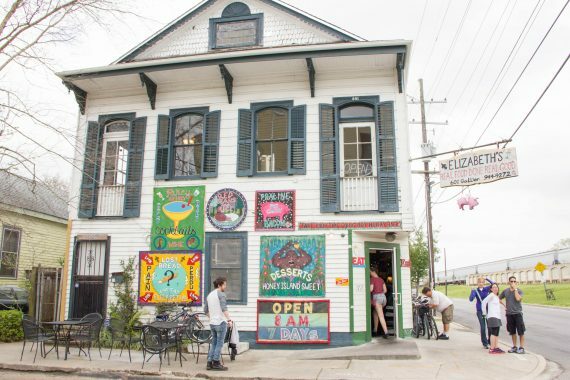 New Orleans really is a big melting pot! 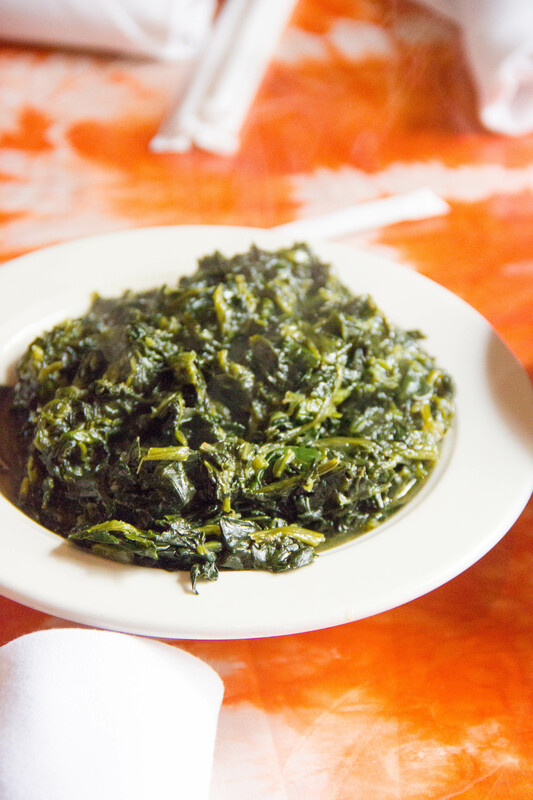 The first stop of the tour was at Bennachin Restaurant, an African restaurant. We tried the jama jama (sauteed spinach) and doh doh (fried plantains). 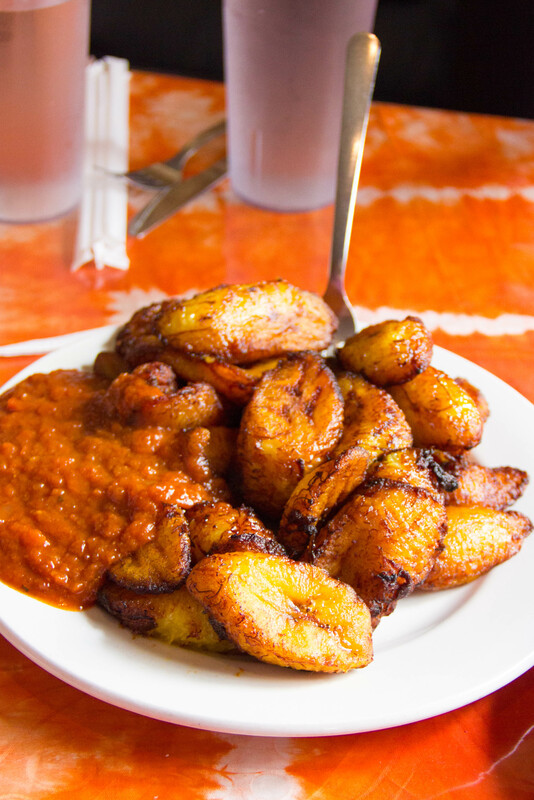 The spinach with hot sauce was good, but the fried plantains with the tomato sauce were the bomb!!! We hopped back on our bikes and rode to St. Roch Market (a food hall with lots of different vendors) where we tried shrimp and grits, crawfish poutine, and a muffaletta. Again, all winners! 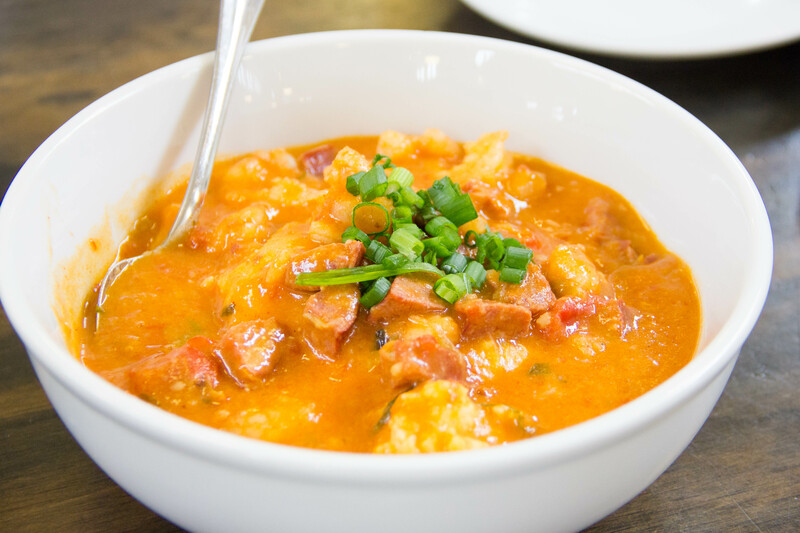 The shrimp and smoked sausage in a creamy, tomato-basil shrimp sauce over pepperjack grits was my favorite. 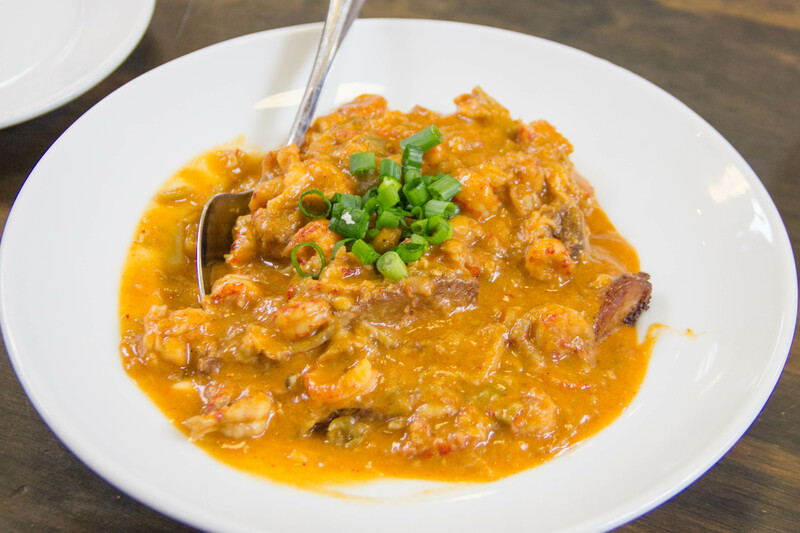 The crawfish poutine was fried crawfish, boiled new potatoes, smothered with pepperjack cheese and buttery crawfish etoufee. I think this was my first time eating crawfish and it was good too. 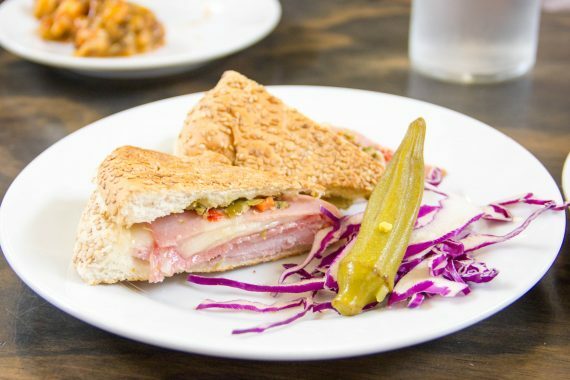 The muffaletta was good, but less impressive as it really just tasted like a really good sandwich to me. The olive salad was tasty though! 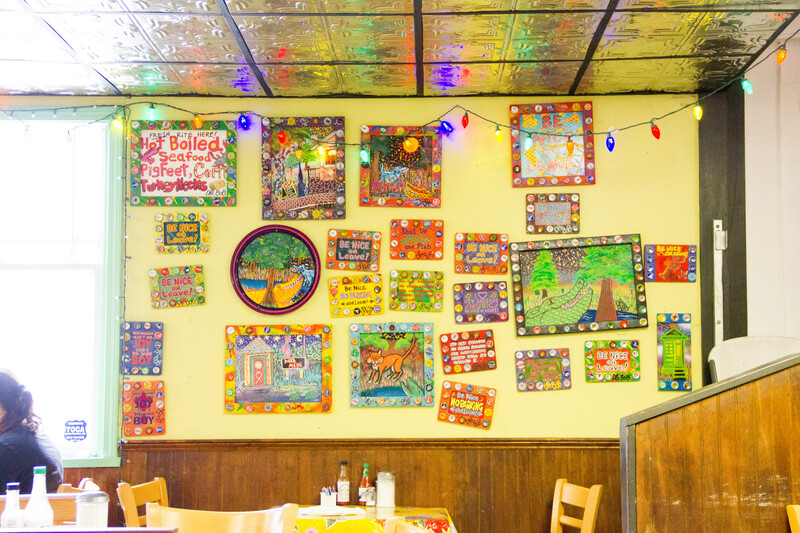 Our third stop was Elizabeth’s. This was my favorite stop of the entire tour! Everything we tried here was amazing!! We tried praline bacon, blue cheese oysters, boudin balls with creole mustard sauce, and fried green tomatoes with remoulade. The boudin balls were so good, definitely one of my favorite things of the whole trip. 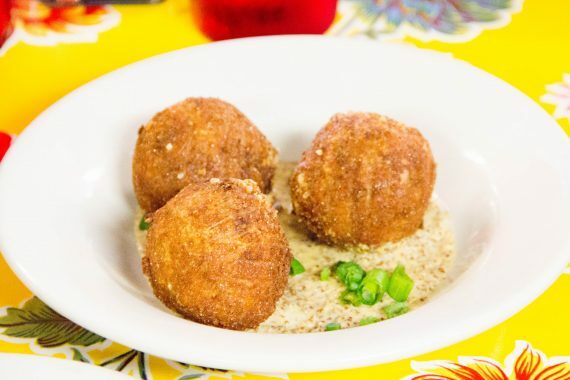 They’re a sausage and rice ball that’s deep fried. They reminded me a spicy hushpuppy…kind of. Yum! 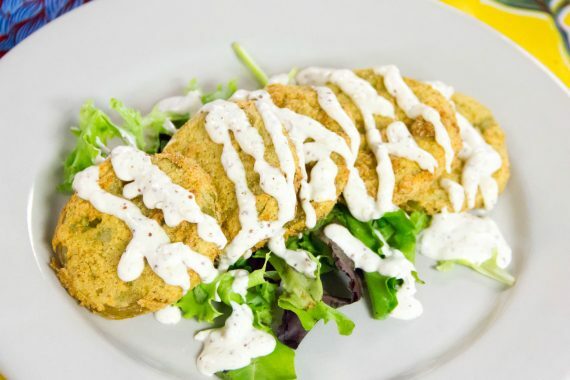 This wasn’t my first time eating fried green tomatoes but the remoulade sauce was what takes New Orleans’ fried green tomatoes to the next level! The remoulade sauce is everywhere and for good reason. 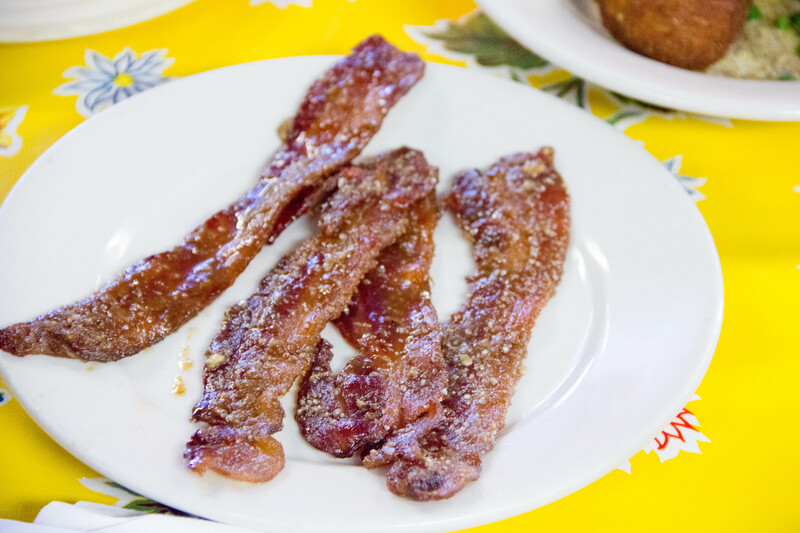 It’s mustard-mayo-hot sauce (and other spices) mixed together and it’s good! 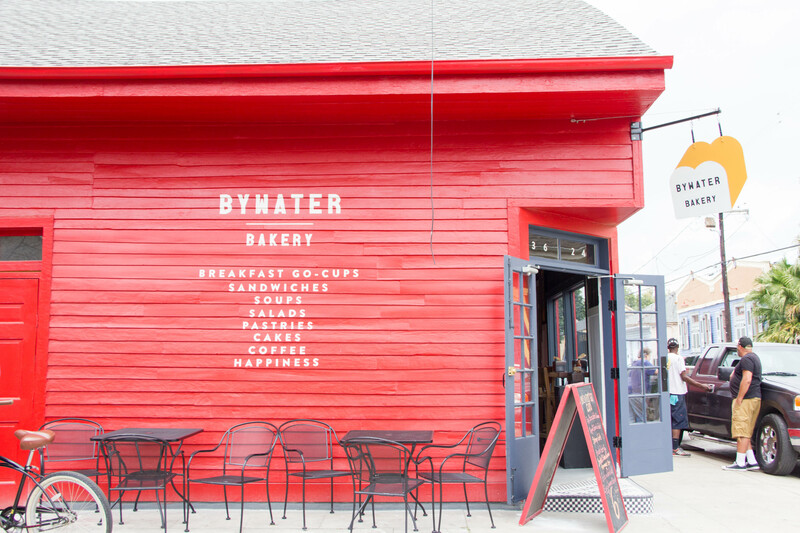 Our final stop was a dessert stop at Bywater Bakery. 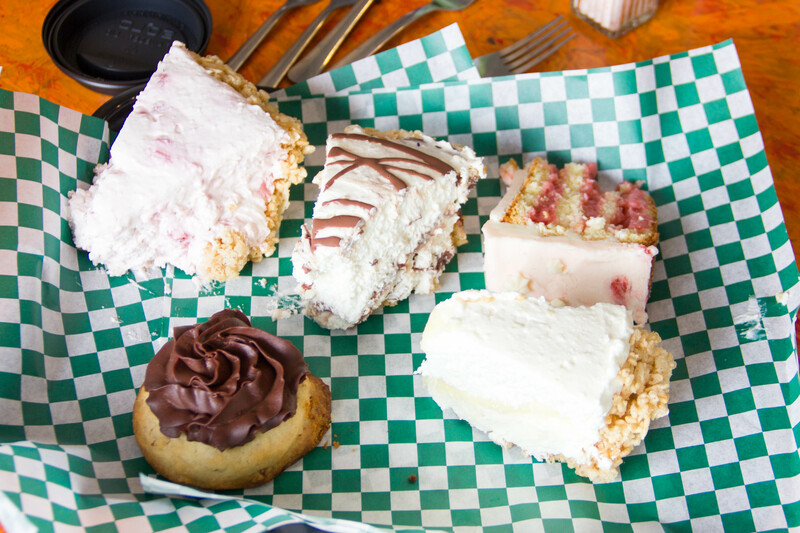 We tried several of their pies, strawberry cake, and a shortbread cookie. I wasn’t really a fan of the rice krispy treat crust as it tasted kind of stale/soggy but the filling was nice and creamy! 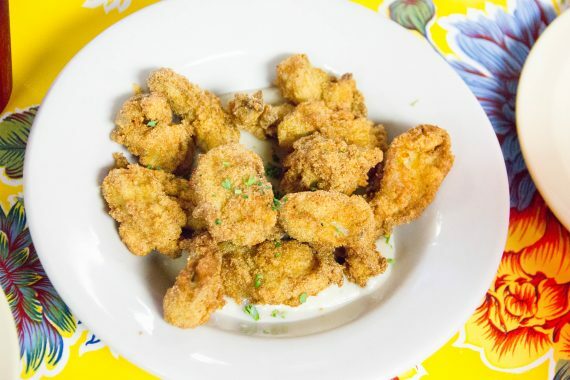 A few other things we tried (not on the food tour) were beignets at Cafe Du Monde, pralines, red fish, alligator po-boy, fried alligator bites, and seafood cakes! 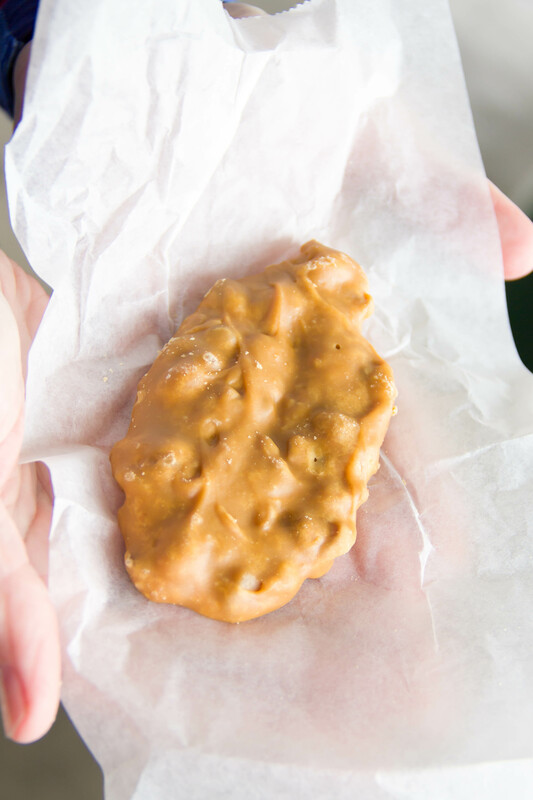 Pralines are EVERYWHERE! They are good, but a little goes a long way. They are very sweet! I felt like the beignets from Cafe Du Monde are over-rated. 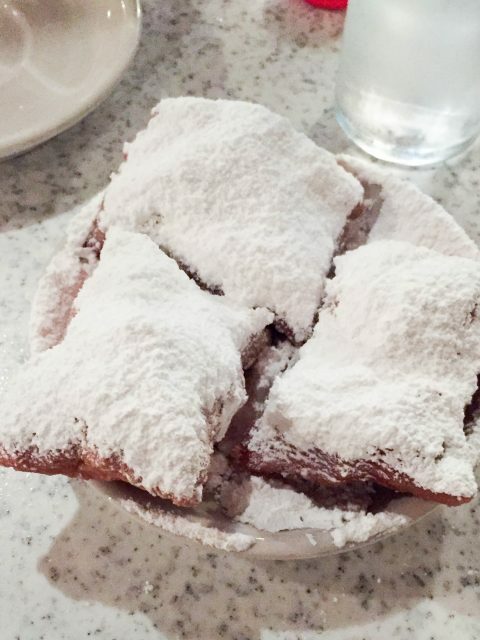 They tasted like a funnel cake to me, but they are so famous I guess you have to try them at least once when you are in New Orleans. 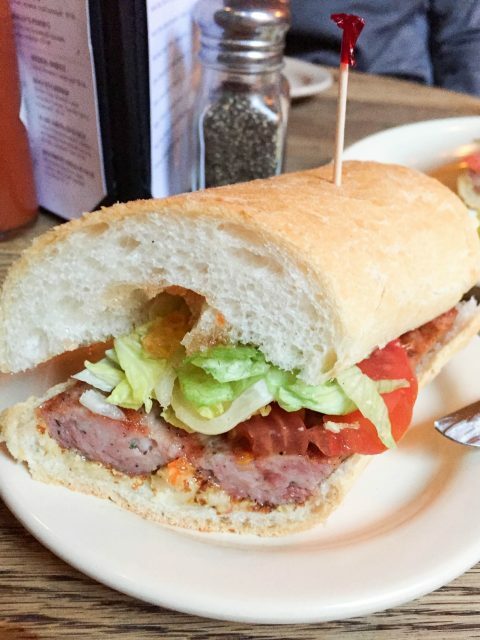 Of course, you have to try a po boy! I tried the grilled alligator sausage po-boy with tabasco pepper jelly and creole mustard from Napolean House. It was delicious! 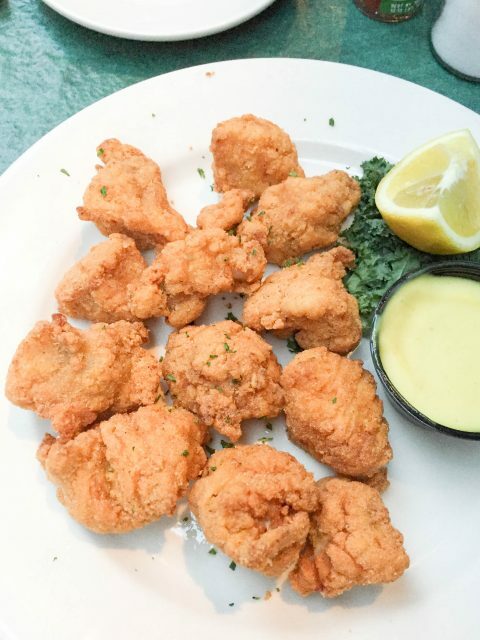 I was hangry by the time our waiter at Pat O’Brien’s finally brought these alligator bites to our table, so maybe that’s why I thought they were so good? 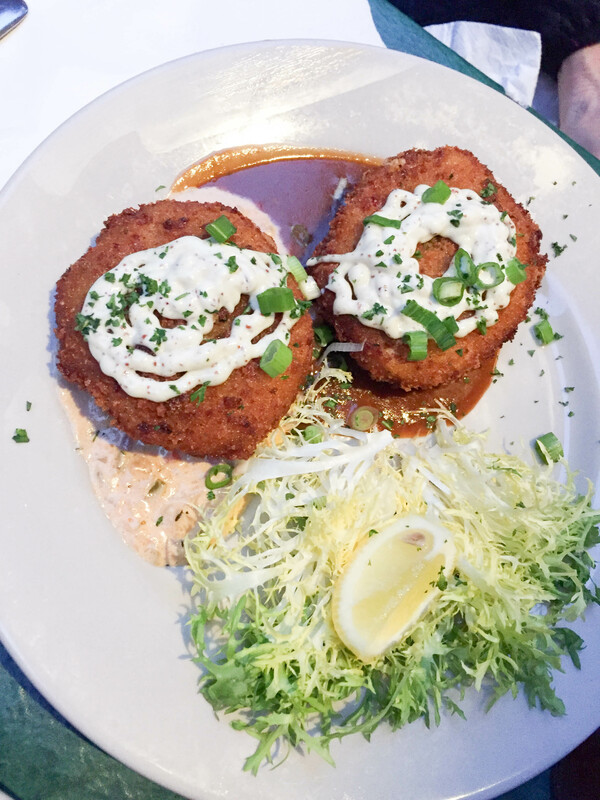 😉 I tried the red fish and mom had the seafood cakes with (more) remoulade sauce (yum!). Both were tasty! 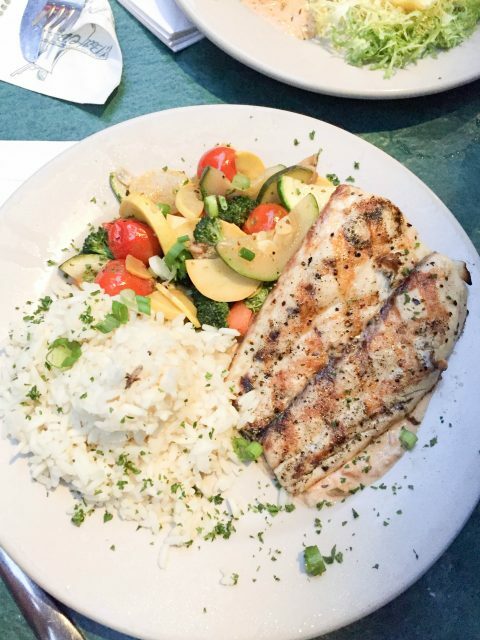 New Orleans is definitely a city full of good food! I’d recommend a visit if you get a chance =).